K. A. Last: It's Tour, Giveaway, and Party Time! It's Tour, Giveaway, and Party Time! June is shaping up to be a very busy month for me. Fall For Me and Sacrifice will be on tour with Xpresso Book Tours from June 17-22. This is a reviews only tour, and if you'd like to follow along you can check out the full schedule HERE. I'll be running a giveaway from now until June 30. 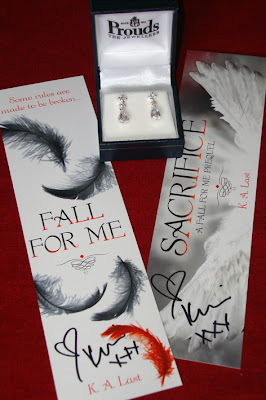 For your chance to win a pair of sterling silver tear drop earrings, eBook copies of Fall For Me and Sacrifice, plus two signed bookmarks, enter using the Rafflecopter form below. For full terms and conditions go HERE. Although it's not mandatory for entry to the giveaway, liking my Facebook Page and following me on twitter would be great! I love connecting with you all. On June 20th I'm having a Facebook Release Party for Sacrifice. There will be heaps of great prizes up for grabs, so why not come along and enjoy the fun. Details are below. Come and party to help celebrate the release of Sacrifice. As well as all the eBooks up for grabs I'll be giving away some jewellery, handmade ribbon bookmarks, and other signed swag. Make a cup of tea (or a grab a wine) and sit back, relax, and join in the fun with some trivia from Fall For Me and Sacrifice. You have to be there on the night for your chance to win. Follow the link above to the Facebook event page to join in the fun. Excited! It's almost over!!! Yay!